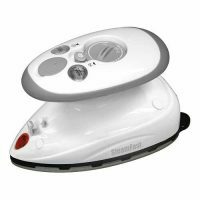 Steam Fast Mini Iron is small and compact but heats up quickly. The iron has a non-stick iron plate making it safe for a variety of fabrics. This iron has a 1.4oz water capacity and runs on 420 watts.